The flexible butterfly combination with swath belt and steel tine conditioning. Kverneland offers a top-of-the-line butterfly mower conditioner combination with a 9.00m working width and swath belt. It consists of a 3632 FT or 3636 FT front mounted mower conditioner with 3.16 or 3.60m working width and two rear-mounted 3.16m mower conditioner units. 4 different output, 3 single swaths, 100% wide spreading, 3 swaths into 1 or two by two. Pendulum suspension with 4 heavy duty springs. Available with swath belt and FlipOver wide spreading. ISOBUS control with intuitive joystick control. Kverneland uses round discs. Round discs are less susceptible to stone impact, and reduce shock loads in the transmission. Stones are expelled immediately, before they have any chance of becoming jammed. The benefits are lower repair and maintenance costs - at the same time as a clean and aggressive cut. The cutterbar has a high oil capacity, ensuring a very low working temperature. This ensures an efficient oil cooling and lubrication of the entire cutterbar. The long curved gear wheels running in oil provides a very quiet and reliable power transmission. The fully welded cutterbar gives a very stiff and strong design for high durability. With the ProFit quick knife change system, maintenance of the cutting ability is easy. The knives are changed by one simple operation using the special lever. Kverneland 5090 MT is the most flexible mower conditioner solution on the market. It can be equipped with wide spreading equipment and the Kverneland BX Auto-Swather solution to ensure outstanding flexibility. It is easy to change between the different configurations, and conversion is very quick. Kverneland 5090 MT can be set for 3 single swaths, wide spreading or three swaths into one with the Kverneland BX-Belt. An extra feature is the fact that the right belt can run in two directions, meaning that the Kverneland 5090 MT will place grass from 6 m into one swath. The BX-Belt is capable of placing crop from either 6 or 9m into a single swath. The right hand belt can run both left and right, giving the option of placing three swaths into one, or in a two by two formation. The 5090 MT and 5090 MT BX are fitted with a balancing weight arm, linked to the 4 heavy duty ground pressure springs on top of the three point suspension, to ensure an even weight distribution of the two rear sections. The low gravity scale arm suspension ensures that the mowing units always remain horizontal in relation to the ground, when working in uneven or hilly conditions, or if the tractor is hitting small obstacles in the field. When using SideShift equipment, the balancing arm also facilitates equal ground pressure on either side of the rear mower units. Kverneland 5090 MT can be set for 3 single swaths, wide spreading or three swaths into one with the Kverneland BX-Belt. An extra feature is the fact that the right belt can run in two directions, meaning that the Kverneland 5090 MT will place grass from 6 m into one swath. When not in use the optional Kverneland BX-belt is raised hydraulically to a position above the mowing units. All you need to do is to push the button on the control box to change the configurations. The Kverneland BX-Belts are floating on two large springs, and thus performing a unique and even swath formation under all conditions (no jumping up and down of belt units). A unique and simple solution with several advantages. Fewer moveable parts, ensuring less wear and maintenance. Better flotation of the entire machine. Even swath formation under all conditions. As an option the Kverneland mower conditioners can be equipped with widespreading equipment. In this way, crop can be cut and spread in one operation, saving both time and at least one tedder operation. The spreading vanes of the Kverneland FlipOver system are placed further back on the mowing unit than with conventional systems. This is thanks to the spreading plate positioned far to the rear when in use. The improved distance between the conditioning rotor and the spreading vanes gives a more even spreading across the entire working width. A more even spreading ensures a better wilting. The SemiSwing conditioner system combines the aggressive conditioning seen from fixed fingers with the excellent tine protection typically associated with free swinging tines. During normal operation the tines are fixed for effective conditioning, but if a SemiSwing tine comes into contact with an obstacle, force will exceed 22kg (48.5lbs) and it will spring back and leave a generous space for the obstacles up to 103mm to pass. The complete conditioner tine has been redesigned to move the centre of gravity. The result is that the tine will stay in position when hitting the crop, to give full conditioner effect and to minimise wear and tear on the turning points. The angle and position of the SemiSwing tines give a better crop transport. The crop is moved away from the conditioner rotor, resulting in reduced risk of blockages and full effect of the conditioner plate. Kverneland 5090 MT Goes ISOBUS with its New Control System. The BX version is now available with ISOBUS control. There is no need for a separate terminal when operating with the 5090 MT’s 9 m working width, steel tine conditioner and the versatile BX Swath. All main functions of the 5090 MT can be transferred to the Kverneland Group Joystick. This makes operation of the 5090 MT swift while securing accessibility and support. The joystick comes in a compact size, easy to place right next to the operator, making it ergonomically well positioned for long days of operation. 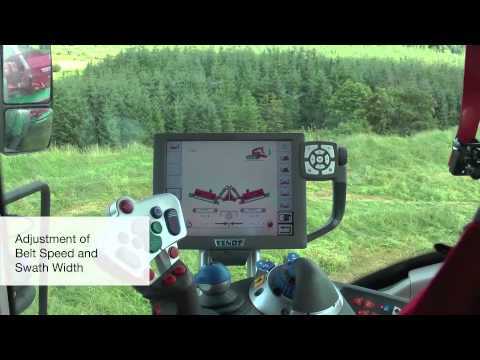 Even more conveniently the control functions can be directly transferred to the joystick of the tractor. This means that the same lever can operate both mower and tractor.